Let’s all admit that there are many overlaps in this series of five—but also that they are life and death when it comes to good doctrine. And the issue or the goal will be to show the uniqueness of each aspect. Grace of course features God’s gifts and the emphasis on His freely given salvation. Faith does talk about our part, and so many people confuse that and think it is simple demon-belief, as James put it. The issue of Christ alone will help us emphasize what He actually did on the cross and as a person, and some people probably could not explain in a few minutes what happened at Calvary. And certainly the two more general ones about Scripture and bringing glory to God can go back to the basics of where we get our truth and why we are alive in one sense. It’s one thing to put our reverence fir Scripture on paper, and it’s quite another thing to live that way. The same with the glory of God. That should not be for Reformation days but also for the days of Noah and for today which is kind of like the days of Noah. So do not be hesitant about dividing this into five messages. They will not be repeats of each other. And they are huge and important. This should not only be a window of truth for your listeners, but a time of great passion for you. These are the basics that influence so much of what we do and believe. Or believe and do. The five Solas began to be called that in the 1900s—these names were not used by the reformers. But as scholars and practitioners like us reviewed the peculiar doctrines and the important ones, they began to see that these five were so important. At first some of them spoke of three Solas, then added two more. R.C. Sprowl tries to explain that each one does not stand alone, but each is important in its own genre—“they spin on different axes,” he says. It’s very important to note that not all of these are about happiness or peace. The Solas are not about us—like so many worship songs, we might add. Rather they are about truth and what really matters and what are the foundations of our beliefs and our salvation. The five Solas are intended to summarize the main issues of reformation teaching—which many of us have adopted as true orthodox teaching! And—let’s say this with kindness—they are all in contrast to the way it was before! And all affect our daily lives, not in practical ways of obedience but in foundational ways of faith. And what we believe does determine our actions. And our confidence. We start our five Solas series with the person of Jesus Christ and his work on the cross. He is the center of this series and of our faith. We should never use the word “and” when we say our faith is in Christ. We do not add, “and I hope so.” Or, “and I’m doing the best I can.” Surly we should do the best we can, though no one really can! But it is Christ alone, and for good reason. The book of Romans in the Bible—the letter by the apostle Paul—maybe the grandest explanation of salvation ever written—and the paragraph we look at today may be the central teaching in Romans about the gift of eternal life through Christ alone. All of us should seek to understand this paragraph and be able to explain it. Here is the Gospel explained with biblical logic, with hope that we would be sure of this in our personal lives and live with total assurance that Jesus Christ is our righteousness and our Savior and our Lord. You might want to commit to explaining the Gospel repeatedly in the pulpit—some pastors try to explain the cross in a minute or two in every sermon, and then try to be very salvific every six week or so. “Preach the Gospel to yourself every day”—and ancient but popular saying—is not about receiving salvation every day but needing a Savior every day. But there’s something good about proclaiming the good news of the Gospel so people really get it and really see how central it is. That’s the purpose of this sermon and especially this section from Romans 3. Our salvation and also our Christian living and our future hope is all related to the person and life and death and resurrection of Jesus Christ. To Him alone. We can thank others and be appreciative, but the accrediting work of making us acceptable to God, the new birth actions, come through Christ alone. This one is clearly related to all the others—and of course they are all intertwined. But in many ways this is the central issue of life! Scripture—where we learn about Christ. He is the central theme of the whole Bible. See Luke 24 where Jesus explains the two on the road to Emmaus that He is the center of the Scriptures, they are all about Him. Grace—God helps us understand and receive Jesus Christ as Savior. So grace alone is the only way we can connect with Christ alone for the rest of life and eternity. Faith—of course that is how we respond to Jesus Christ. And grace produces that faith, we understand from Scripture and from experience. So Christ alone is so vitally connected to faith alone. Glory to God—actually one of the great themes of the Bible is that God is glorified when people believe in His son and are saved. Fact is that Jesus Christ will some day bring glory to God by bringing all the world together as a gift to the Father. It all ends up with Jesus Christ as Lord and God glorified by all the world, whether through faith fulfilled or judgment experienced. See Ephesians 1. You may wish to teach the diagram before you do the outline and the sermon part. The diagram in many ways explains Romans 3:21-26, the best explanation of what happened on the cross. Everything on the diagram supports the idea of “Christ alone.” It is because of who He is and what He did that all of this can be said. The point of this diagram and this whole sermon of course is to point to Christ alone. But even more specifically, to help Christians and unbelievers know exactly what this Gospel is. This is an answer to what a person said to me, “Of course I believe, but I just don’t know for sure…” And many people talk about believing in Christ but aren’t sure how that belief is above that of the demons, who believe He existed and even died on the cross and rose again. “The demons believe and tremble” about all that. So this Romans 3 explanation with some arrows to bring clarity is to explain what it is we are called to believe. 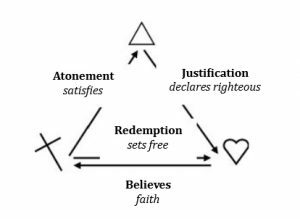 All of the explanations in this diagram are from Romans 3:21-26. Be sure to point to them, the verses. Be sure to help them see this is not about feelings but about the content of our faith, the facts that we rest in. The first one from the Son to the Father: He makes atonement for our sins, or satisfies and covers all the laws of God about holiness. We learn as children that “Jesus died for our sins” (John 3:16). True. But this paragraph in Romans explains how His death covers our sins or takes them away. So when Jesus died on the cross He took all the sins of Adam and Eve and David and me and you and paid the judgment for them. “He was made sin” (not a sinner) for us. See II Corinthians 5. When He cried out, “My God, My God… forsaken” it was because all of our sins were piled on Him. The sky turns dark purple, the rocks roll, there is a quake, and at this point God is judging the sins of all the world. The judgment is put on the Son. We are asked to believe this when we are asked to believe in Jesus Christ as Savior. Sin must be judged, and He did it for us. You start with Romans 3:25 on this one—it might be healthy to keep reading the whole paragraph when you pick out these phrases. Here the word is “atonement” or “propitiation”—the satisfying of the Holy laws of God by death. By a sacrifice. By the perfect Lamb of God. Paul even states, “this was to show God’s righteousness, because in His divine forbearance it passed over former sins.” In the Old Testament sins were covered over—it was as if God pulled a plastic covering over all the sins that were atoned for by the sacrifices and the faith of the people. But they were not really punished. Hebrews argues strongly that no lamb or bullock or offering could take away the sins or really pay for them. So in a sense at this point in history, God pulled the cover off all the sins of the Old Testament and all the sins of our lives and all the people of the New Testaments times and all the sins to be committed tomorrow—and the Son was punished for those sins or took our judgment. Many other verses support this also. But it so clear here in Romans in this descriptive paragraph. So the first arrow is what the Son did in relation to the Father—He satisfied the Father’s Holy laws. He took the wrath of God for our sins. The second arrow goes from the Father to the believer, the person who receives Jesus Christ by faith. This too shows in this wonderful paragraph which starts, “But now the righteousness of God has been manifested.” That righteousness is a gift. “Justified” means more than what children are often taught, “just as if I had never sinned.” It means that we are declared righteous. (This by the way will show up even more in the “Sola Grace” and the “Sola Faith” explanations.) No one can earn his or her way to God but is declared righteous rather than earning righteousness. The debate here in the Reformation was about “infused righteousness,” earned a bit at a time by faithful obedience and celebration of the Mass and more; and “imputed righteousness” where God declares we are righteous on the basis of the righteousness of Jesus Christ being counted to or imputed to our lives. So this justification is the act of God who counts the perfection of Jesus Christ as a covering for us. This is so different from being religious—trying to climb our way to God. “Climb, climb up Sunshine Mountain,” is the song some of us sang as kids. But instead here it is salvation coming down. It is grace. It is all about Jesus Christ. Verse 21 is so clear: “But now”—since Jesus came and died and rose again—“the righteousness of God has been manifested.” The righteousness is a gift. It is a declaration. The arrow from Jesus Christ to the believer is about redemption. He sets us free. You might use an illustration about giving a price for a slave—call him Benjamin—and you give the money to the owner of the slave. You are redeeming him. Redemption is the freeing of the slave from the penalty and even the power of the master. It is our freedom from the penalty and judgment of sin. We are set free or redeemed because of the price paid by Jesus Christ. There are many verses that back this up. The fourth arrow is from us to Jesus Christ, about believing or having faith. The word “faith” or “believe” shows up four times in this paragraph, Romans 3:21-26. And this negates the comments of those people who say, “I believe, but I just don’t have enough faith.” It’s actually the very same word. “Believe” is the verb and “faith” is the noun. So that Jesus Christ is at the center of our faith. And it’s more than just saying we believe He was here, as the demons do. We believe He is the perfect Son of God who did what is diagrammed here and explained so clearly in Romans 3:21-26. Verse 22 says that this righteousness is “through faith in Jesus Christ for all who believe.” There are two uses of the word. It means that we trust all of this is true. We rest in—see Hebrews 4 about Sabbath rest—the finished work of Jesus Christ and the person of Christ. It is Christ alone for sure. That is an attempt to summarize this paragraph, as the diagram is an attempt to picture it. “Sincerity is the key,” so many people say. No, God is the key. “Christ alone” is the key. Righteousness comes as a gift from God. See Romans 10:3—nothing could be clearer. See Philippians 3:9—maybe this is the only verse that could be clearer. And all this is why it is good news. Religion is our feeble attempt to do our best for God while God’s good news is about Christ’s doing His best for us. He did for us what we could never do for ourselves. He gave what we could not possibly earn. He changed our eternity by one person. “Apart from the law.” Even though the “Law and Prophets testify” to this. In some ways it started in the mind of God even before creation. In some ways it started in Bethlehem when the Creator of the world “becomes flesh and dwells among us” (John 1:12). But clearly it is a gift. Righteousness and salvation are gifts, both in one person. We are called to accept the pronouncement of the judge, that “all have sinned and fall short of the glory of God.” See verse 23. Most people today do not argue with that—they just pretend it has no consequence or meaning. They are not convicted in their own conscious about their own sin. We “fall short.” It is correct to say that we must be perfect to go to Heaven. God cannot look upon sin. He is, as Habakkuk said, “of purer eyes than to behold inequity” (Habakkuk 3:13). This is truth given in Scripture over and over but omitted or disbelieved by many people. We “fall short.” It would be as if we tried to swim across the Atlantic Ocean, starting in New York city. To get to Paris. And some might make it along way out—a mile or two. A few quit in the first 100 yards or cannot swim at all. But all fall short. And we all fall short of the holiness of God. We need a savior. We don’t need someone to teach us how to swim, but to jump into the water and pull us out. Verse 27 talks about believing and the word is used four times in this paragraph. Romans says that because we have faith in Jesus Christ we have no condemnation. The meaning is that the we believe what this paragraph says. We believe who Jesus is. We believe He took all our sins on His back and satisfied the Holy laws of God by the way He lived and by the judgment with which He died. We believe that God declares us righteous because of the person of Jesus Christ. Our faith is in Jesus Christ. We have “faith in His blood.” This paragraph says it well and so do so many verses in all of the Bible. See John 10:42 and Act 2:24 and Galatians 2:16 and 3:26. It is Christ alone where we put our faith. Urge people to be sure of this. One way to tell where our faith resides is to answer the question asked by many in previous years, “If you died to today and went to Heaven and God said, ‘Why should I let you in?’ what would you say?” While it does not work like that, the question does put all our cards on the table. We have nothing to say that would save us except that we’re with Jesus Christ. We believe in Him. We rest in Him. We fix our faith on Him and combine with Him for life and for His righteousness and indwelling Spirit. Christ alone also implies that no other saint is on the same par. This was one of the strong reactions in the Reformation—reactions to the past that no one else should receive glory. And of course we would not say that we glorify other people, but it is a good caution to think that Christ alone receives our thanks. People are instruments to help us grow in Him and bring us to Him. To be candid, this would also relate to the veneration and sometimes worship of Mary. Or the other saints. It is Christ alone that we honor in terms of worship. Others should be thanked and acclaimed of course. Of course this issue excludes the priestly class as necessary for worship or sacraments or getting to God. So the “alones” are very clearly arguments for the Reformation and also results of it. There was no room for the assurance of eternal life, for personal satisfaction that was settled, in the early church. Most of the leaders thought that if you were certain of that you were committing the sin of presumption. Luther and other Reformers taught that Jesus become our righteousness. Luther wrote, “Thou hast taken upon thyself what is mine and has given to me what is thine. Thou hast taken upon thyself what thou wast not and has given to me what I was not.” Jerry Bridges called it in a book, “The great exchange.” We call it our confidence. This one is loaded—well I guess they all are. But every church and every believer must fight the battle of tradition and secondary or tertiary issues. What to believe. What is the real source of our doctrinal statement? Of course the historical context related to the Reformation raises the gigantic issue of church leaders voicing doctrine versus Scripture pronouncing truth. Many of us grew up with all kinds of traditions that were elevated by our churches, whether they were Roman or not in their orientation. We have the incongruence thoughts about not going to Heaven if Jesus came back while you were in a theatre with a Hollywood movie, or the more debatable issues about gifts of Saturday or Sunday. This sermon should clarify those things. But much more than that, this sermon should and can provoke people to Bible study and obedience. It’s one thing to say we believe the Bible is the true word of God, and quite another to read it and study it and obey it. Pull out your churches statement on the Scriptures and what you believe, and give it appropriate exposure in this sermon also. Pull up your own practices and desires and let them in on those also, as you stand with them as a fellow struggler but also as an example. We will look at this part of Peter’s second letter to the churches and to us, not trying to expose every word or every thought in the context of that letter as much as show how it all relates to this Sola of the Reformation—that Scripture is sufficient. Verses 1 and 2 of course identify Peter, “a servant and apostle of Jesus Christ” as the author of this letter. Later he will say how much help he had from God! And verse 1 also shows the importance of our understanding the nature of salvation—that we are brought into “equal standing” with Peter “by the (imputed) righteousness of our God and Savior Jesus Christ.” That paragraph in itself shows us the importance of the Bible and of the priesthood of all believers and of believing in Christ alone as our salvation. We stand in the same righteousness that saved Peter, the revered apostle. The one who did indeed hold the keys to the kingdom, and is thought by some to be the first Pope. In one sense. Peter is going to show us that what his writing is from God and is sufficient for sure for our godliness and for our way of living. We do not need human tradition in addition. Of course we will have our traditions, but they should never be put on a level with Scripture. Verse 2 gives us hope. Granted it is a beautiful greeting and might be used at the start of our emails now! But it again emphasizes the wonderful gifts we have through salvation, including how important are the writings of Scripture—to give us grace and peace through our understanding and our knowledge of God and of Jesus our Lord. The verses argue for the sufficiency of Scripture, at least when you believe God and what He has revealed for us. A good parallel to see is the start of Romans—especially verses 1-6 and especially verses 1 and 2. There Paul shows that God’s promises come from Scripture (1, 2) and center on Jesus Christ and His plans for the world (3-6). While Romans is the great theology of salvation and sanctification and even Israel’s’ future, it all centers on Jesus Christ. There’s some parallel here to what Peter will do in his second letter. Again, our goal in this sermon is not to totally share exposition of these verses—surly some of that. But especially as they relate to our subject—Scripture alone. Verse 3 is huge! By the Spirit of God indwelling us and according to the promises given in the Scriptures, we have divine power for “all tings that pertain to life and godliness, through the knowledge of Him (Jesus).” Any questions? This is one of the strongest verses to refute the need for extra teaching or tradition, or “special gifts” that come only to a few! Tell a story of someone trying to convince you to take the “extra step” that brings you certain spiritual gifts or certain extra blessing from God. What channel is that on your own TV? Verse 3 refutes that and tells us that in the Scriptures and in the Savior or course—we’re not just talking objective revelation but also a personal ensured relationship with Jesus Christ that is spiritual—we do have all we need. Verse 4 shows that we have “precious and very great promises” that help us live in connection with God, “partakers of the divine nature.” How can anything be more challenging than to read this, and satisfying and enough if we will believe and live in obedience to the obvious implications? So the resources are there for us. Scripture is the word of life, and not just idol words. See Deuteronomy 32:47. The words are spirit and life—see John 6:63. There is a clear way and it is for all of us to understand and is not waiting for extra explanation or tradition. In fact, the Scriptures give us guidelines, because they are the words from God, about how we participate in God’s nature and how we live in combination with Him. See Romans 6:16 and II Corinthians 5:17. A good illustration here is marriage—a partnership or a combination life. Obviously this is Peter’s reference to an event that he attended! You might want to make the story of the transfiguration in Matthew 18 your scripture reading for the day. Verses 16-18 describe Peter’s experience there and his feelings about that. We could only imagine the bright lights of glory that showed who Jesus really is. (And remind people that this was not a change in His nature but an illumination or picture of it. He always was the perfect and glorious Son of God. But here in physical ways that holiness and brightness and glory shown though.) Peter and James and John and now us and we should believe this and realize that He is the one we follow. Use verse 16 to show how easily we form committees or religions to come up with sometimes clever myths ourselves. But any traditions or extras should not be the basis of our faith. Peter is centering our faith on the person of Jesus Christ, as explained by the inspired word from Jesus Christ or Spirit of God. Verses 17 and 18 complete Peter’s description of that amazing and privileged experience. Remember when we were little and sang, maybe, “This Little Light of Mine”? It was a fun song but what Peter is referring to here is no little light. This is the brightness of the Creator of the Universe. This is the glory of the one holy human being who walked on Earth. This is complex holiness and truth at once as shown in a person. Peter is now going to draw the parallel with that very true and very physical experience of seeing his savior glorified on the top of the mountain. And that’s going to give support to the truth that we have and the light that we have in the written Word of God—Scripture alone. You may want to add, if there is sufficient time, thoughts about the three disciples coming down from the mountain and getting right back into the swing of things as weak human beings. The transfiguration picture did not change them enough. They join in arguments about who is the greatest and they still failed. Even as the Scripture will always be there but we must place ourselves under its authority and in combination with the Spirit of Christ live it out. The following is a wonderful argument for and presentation of the sufficiency of the Word of God. And our need to obey it. It is “something more sure, the prophetic word.” The Word from God. And it gives us light. No one is going to say that it will always be easy to study the Bible. One thing that will make it easier is if we remember how we got this, and what it can do for us. It is a light for our lives. We study it to get light for our daily living. It’s interesting that Peter is very candid: we would “do well to pay attention.” We should treat it like we’re in darkness and we need the light. We should respond to it as if we need a map or a GPS for us when we don’t know what to do. Isaiah said it this way, “To the law and to the testimony. If they do not speak according to this Word, they have no light of dawn” (Isaiah 8:20). When we walk in darkness we need a flashlight. When we live this life on earth, we need help from above. And Scripture, with all the resources of the Spirit that it points to, is enough. Jeremiah 17:9 reminds us that the problem is not just the darkness but our own shallow trust at times or our mistaken trust in ourselves. Peter says this is like a lamp shining in a murky place. It is the prophetic Word of God, the inspired Word that gives guidance. God is willing to guide us into all truth and the Scripture is sufficient truth for all the guidance we need in this life, about life and godliness. In the cartoons it’s a light bulb that goes off over the head and it’s an idea. It’s light for what we do. But this is serious Scripture for light as a guidance for our lives. We could also dwell on light bringing warmth and joy, which Scripture does. But especially here it is about guidance—and we do not have to wait for extra guidance from the church. The Scripture is God’s will for us. Some of us like to say that we major too much on figuring out the will of God for us in subjective ways—the Scriptures are the will of God for us. Martin Luther wrote, “Love God and do as you please.” And the meaning of that must be accepted carefully meaning that if we love God we will keep His commands, and then we must choose what to do on the issue where His commands are not guiding us. Meaning, they do not talk about everything we do. This is about a kingdom lifestyle—God’s will as a way of life, as illuminated by the Scriptures. And all for our benefit and the glory of God. Because God really does know best, by far. The Scriptures are especially light and guidance in character, influence, a mission in life, our witness. The Scriptures are en encyclopedia of how we should act and how we should treat other. It is light for all of life. In one sense we could say that Scriptures give us light for the end of the tunnel also. And it’s not a train that’s coming, that light at the end of the tunnel. It’s Christ. His power in coming. The morning star or day star will arise for all the earth some day. And in the darkness of today, this is good. Scripture gives us that hope. That light. And we do need to know that the next world will be a lot different from this one. Death will be gone. All of that is in the light we get from the Word of God. In fact, Peter is making that issue when he says, “Until the day dawns and the morning star rises in our hearts.” That’s the daybreak ahead. That’s the rising sun from Heaven—see Luke 1:78. See Revelation 2:28 and 22:16. Almost all commentators agree that there is an allusion to Numbers 24:17 here—“a star shall rise out of Jacob.” Almost everyone interprets that messianically in Judaism and we do too. The star is the morning star, applied to Jesus in the Revelation passage. He is the bright morning star that tells us the day is coming when He is Lord of all. He will be the perfect daylight when He returns, taking away all the darkness. Until then we need His Spirit in our lives and His Word for our guidance. There’s a very real sense in which people who put stock in all this must have better hearts now. Our hope and our best and our treasure is Christ. His light comes into our hearts now and someday will come into the world and it will be as real as the transfiguration was for Peter then. This is a strong verse about new ideas, in one way. When someone says, “I’ve discovered something in Scripture that no one else thought of,” beware. No prophecy of Scripture is just one person’s opinion. And by application there is not a new understanding of something that nobody else backs up. Scripture is elevated in this verse, along with verse 21, to be way above our own interpretations and ideas and writings. This is Peter’s most powerful statement about the inspiration or the Word of God—people were moved along or “carried along by the Holy Spirit.” Whether they knew it or not, they were writing for God. And it’s pretty obvious the writers knew they were doing that, much of the time. And the early church recognized that it had made the Scriptures important reading and the true curriculum of God’s revelation. Probably all of us have strong sermons and writing on inspiration based on this verse and II Timothy 3:16. Take some time with both of those verses and help people see how this elevates Scripture to be way about our traditions. When verse 21 here is understood, it gives new meaning and little importance to any idea that contradicts it. It also reminds us to be very cautious church traditions and family habits—not that we shouldn’t have them. But we should never elevate them to be on par with the inspired Word of God. The Word that abides forever—see I Peter 1:25. See Psalm 119:1-8. Jesus assured us that His words would never pass away. They must never pass to second place in the life of a Christian or the church. Somewhere in this part of the sermon is a good place to insert things like I Timothy 1:4, and the controversial myths and side teachings that the church can get off on. I Peter 4:7 tells us to have “nothing to do with godless myths and old wives’ tales,” but instead to “train yourself to be godly.” II Timothy 4 warns us that people will turn away from the truth and enjoy myths instead. Could we insert “traditions” or favorite preacher’s ideas? negative—not human or “private.” Like a windsurfer or someone in a sailboat, people were carried along by the wind, the Spirit. Such fantastic claims deserve our attention. This is the “Word of God”—the phrase brings tons of importance and deserves our discipline. Regular and careful study and assimilation into our lives. Include something of your own discipline of getting the Word in your life. Remind them how it is meant to be a strong personal help. The Word and the Spirit are most vital. While the Word is brilliant, and the points of the Bible go together to show us many fulfilled prophecies and exemplary truths for daily living, it is not effective in our lives unless we know it and obey it. And it is far above all the extras that are in life. You may wish to give arguments that are very strong to prove the Word of God is the Word of God! The unity of its content, the prophecies fulfilled, and there are many examples. Especially the ones, the prophecies, about Jesus. There’s also the accuracy of facts, and the preservation of Scripture. But do not compete with yourself about how important is the Bible as our soul and unique content of revelation for life. And thus we see why the reformers emphasize this so much, for tradition builds up and builds up over the years. Scripture is a sufficient rule for deciding issues of faith and practices related to doctrines. It is enough. It is all that we need for “life and godliness,” so as Peter says it. So it is not the Bible plus traditions or plus the interpretation of our pastor or our priest or the Pope. We want to be kind to the Roman Catholic Church, but of course the Reformation was a breaking away from their clear teaching that it is scripture plus the church traditions as defined by the Pope that makes our ways of doctrine and practice. Our own Catholic church taught that we need the church to interpret the Bible for us, or to guide us. We need the papal office to decipher the exact meaning. Thus the church can change its understanding and call that a new tradition or a new rule. Of course many Protestants, people in reformed churches, grew up thinking that only the teacher or the pastor could really understand the Bible. How many avoid reading it because they say it confuses them? Part of the Reformation teaching was to make a difference between elevated family opinions and the highness of Scripture. We need to do that. Family opinions are very important, with traditions and convictions. But Scripture is highest. Wyckliffe, born in 1330, popularized the Bible. Many in the Roman church did not want the common man to read it. He of course tried to change that. Some of the early councils declared certain things were on par with Scripture. One of the councils used interchangeably thoughts from what Scripture said or what the popes said. God’s promises do come from Scripture but mans’ theories come from the same place as homemade apple butter. Somebody in a committee or in a living room or in a church dreams up an idea or makes an application of a teaching of Scripture but takes it much further than the verse takes it. For instance, among us are people who grew up being taught by a few that if we were in a theater or movie when the Word returned to earth, we would not accompany Him on His flight back to Heaven. Ask anyone who was scared when coming out of a theater. That may be one of the most ludicrous, but it was common. And there are some like that still around. Now when we shift to theology, the Roman view was that church leaders could add interpretations or nuances or even new revelations to the revealed Scripture. So this was a huge issue. It was for the reformers but it still is. And the issue is not that we should all do away with personal convictions or have no rules for ourselves. “Be hard on yourself and easy on others,” an old warning, still applies to areas of application. But this lesson is about “Scripture alone”! Meaning, not traditions, or not our interpretations being made just as important as the Scriptures. Obviously denominations and groups of churches have to decide what are their central points, but they also have to decide, or should, that Scripture is primary and that their personal convictions of things not clear in Scripture are secondary, and in areas of liberty. That’s hard for us to do. The Scriptures do center on Jesus Christ and His grace and His work for us. That is clear throughout the Bible. Most of our rules or our traditions center on opinions we wish were true or applications we have decided to be important. Fine, but the central point of church and evangelism and even our Christian lives should be the person of Jesus Christ and what He clearly did and what He clearly taught. Take some time to ask some people what they have heard from nonbelievers about reasons why they have stayed away from church or about Jesus Christ himself. You will not hear about teachings of Scripture, but probably about people said they represent Christ or who took the teachings of Scripture and jumped to their own traditions. The personal and worldwide results of the Gospel. Traditions and things we add to the Scriptures give no promise of hope. They confuse people. No question about that. Romans has a lot about the future, especially at the end of chapter 8 and in chapters 9-11, and then the present future and how we should live in chapters 12-16. But our traditions do nothing for worldwide victory for Christ. We must be careful that this lesson doesn’t denigrate traditions but puts them in their place. And they have no place when it comes to the eternal that is promised in a Person, Jesus the Christ. Dare to take a survey of all your people, with hopes that many of them will respond, and ask them to explain the gift of salvation in a few paragraphs. You may feel a measure of disappointment. So many church people sing “Amazing Grace!” and talk about grace and maybe are glad that somebody has it for a middle name, but still cannot explain what God does for us to make us perfectly clean in front of Him, and forgiven of all our sins, as a true gift. They add, “And I…” so many times. So don’t hold back any passion in your study or even presentation about the understanding of grace. It not only changed Martin Luther’s life, and others then and now, but it could really change the heart of some of your listeners. This is the famous chapter on resurrection—talk about grace. God’s grace extends to our death and way beyond, to our eternity. And Paul has just defined the Gospel again, “that Christ died for our sins in accord with the Scriptures, that He was buried, that He was raised on the third day in accordance with the Scriptures” (15:3, 4). Verse 9 is where Paul calls himself, “the least of the apostles, unworthy to be called an apostle, because I persecuted the church of God.” We know about Paul’s death dealings with Christians, and how he himself was arrested by the Lord on the road to Damascus in Acts 9. What a conversion! Grace is the unmerited favor of God—a frequent definition. It is indeed the riches of God given to us when we were broke. The goodness of God covering us when we were sinners. It is a whole new format for our lives, and a whole new status in front of God. And by the nature of the definition of the word, it is totally free. It is a gift. “Not of works, lest any man should boast” (Ephesians 2:20, which follows the two verses that say it was by grace that we are even saved or forgiven or made righteous or declared fit to live with God forever, starting now). So grace means you can’t add anything to it, by definition. It is simply of God. James said that all good gifts come from above (1:18). Paul asks us as he had realized himself, “What do you have that you did not receive?”—thinking of all the good things that come from God (I Corinthians 4:7). So that is what is the cause of our new standing in front of God or with God or in Christ or with Christ. “I am what I am.” What are we? Here you might take a few minutes to have verses that show and explain or just state what we are in Jesus Christ—new creatures (II Cor 5), the children of God (John 1:13), accepted “in the beloved” (all through Ephesians). We are His own. Many of the ways God loves us are in the Bible and especially applied to those He calls to be His children. Paul knew that he had been born again, starting a new life, and in a new status with God. He knew that God saw him as totally forgiven because the judgment of Christ applied to him totally. God saw him as totally righteous because the perfect righteousness of Jesus Christ covered him, in a righteousness that was not his own. “How sweet the sound” indeed. And it is that grace that turned Paul around in a dramatic way on that road to Damascus, with a shining sunlight and blindness and a new mission in life. “I once was lost, but now am found, was blind, but now I see.” And it is all of grace. If we try to add anything to grace, it no longer is. Can grace be in vain? Read these verses carefully and slowly. They say so much. Grace made him what he was, as it does us. And it was not “in vain.” And the way he shows that it was not in vain is how hard he worked. In a sense, grace can be in vain, if it doesn’t make a difference. The whole argument of the book of James is that it is not really effective grace or faith when there is no work or no good works as a result. Actually Paul used this same type of argument in I Corinthians 9:1-27 to defend his apostleship—how hard he worked and how much he did, even “all things to all people” in his efforts to save the unbelievers. So here he is saying that the one who once persecuted the church now tried to build it in a stronger way than any of the other apostles. So the grace proved effective in his life. Part of grace was also that Christ would live in him and be in connection with him all of his life. That too is God’s grace. Not only His forgiveness for our sins but His strength for the day. So Paul is clearly giving God the credit not only for his conversion but the effect of that conversion with the way he served. In the next verse he will explain that he did not do this on his own. Are there degrees of service? Well whatever we say in theory, we only have to look around and at our own lives and that, yes, there are degrees of service. Some people talk about God’s grace but never show its effect. Some people show its effect but with little effort to spread the Word or help in the work of Christ. But this verse was not written so that we would start comparing the grace of God and its effect on our lives and its effect on other lives. Paul was just saying that the grace changed his life. It changed his motives. It changed his actions. And what he tried to accomplish was because he realized how good God had been to him. But there’s a lot more here—it is that the grace of God also gives us the Spirit of God for strength in our lives. So grace is not about conversion only, but about a whole new life. If we are in Christ we are whole new creation (I Corinthians 6). And it is the grace of God continuing to work in our lives by His Spirit and by things that are much more than coincidences and strength that is much more than self-help. So Paul is grateful for God’s gifts and the new drive and strength it gave him for daily living. Paul writes quickly but this was a huge issue. He had just referred to his hard work—“though it was not I, but the grace of God that is with me.” That’s the Spirit of God in him. That’s God’s continuing gifts. The same Lord that brings us to Christ by His own love and strength also helps us abide in Christ and have an effective life that does good with others. That too is grace. There simply was no room for pride in Paul’s life, because of the way he understood grace. Paul says that we were living in the passions of our own sinful flesh, carrying out evil desires. “Children of wrath, like the rest of mankind. But God… “ (from Ephesians 2). And then Paul gives that high description of what God did for us when we were dead, and that He not only saved us by grace, but that He “raised us up with Him and seated us with Him in the Heavenly places in Christ Jesus” and even brings up the promises of the coming ages when the continuing riches of the Lord are shown in our lives and in our existence. Then comes the famous Ephesians 2, 8, 9. But we must never forget 2:10—which calls for us to do good works in Christ Jesus. And Paul knew that. He know also that it was the strength of Christ by His Spirit that caused him to do good. It was the fruit of the Spirit as defined in Galatians 5:22, 23 that produced this new life. It was Christ in him, “the hope of glory.” So it was a combination life. In Galatians 2:20 Paul says that he was made dead with Jesus Christ, in combination with Christ on the cross, at least by position. He says that he no longer lives, “but Christ lives in me.” And that is made possibly by faith. When we trust Jesus Christ and invite Him to come in to our lives, that is the beginning and not the end. That is a new way to live for sure. So often people see grace as getting us to the starting point instead of a whole way of life in combination with the indwelling Christ. Just as a wedding is not the end but the beginning of a new life in combination with one another, so it is with conversion to Jesus Christ that begins His living with us and in us by His Spirit. Hebrews 4:14-16 calls us to ask for God’s help on a regular basis, to come to “the throne of grace” to get help in time of need. It’s a beautiful description of what it means to pray to God and ask His grace and His favor to live this life, which can be superfluous without Him. That means we should pray and ask for help. It means that God is always willing to supply strength in our lives and to do His part with us. Philippians 2:12, 13 shows the partnership or the connection life—that we are to work out our salvation (think good health for the church or for you as a person) with fear and trembling, and that God will then work in us. We do this together. He is the only one who can grow flowers, but He does it in the yards of those who plant flowers. He gives meaning to lives and purpose and strength to lives who seek His help. One writer said that this graces “is a stream of living water flowing through the desert, a power which enables us to withstand every adversity and to reach the promise land, the place of our rest, the Heavenly Jerusalem.” And it is the strength to serve others and to make it through hard times and to overcome assaults of the enemy and to run to the end of the race (Hebrews 13:9; II Corinthians 12:9 and forward). The symphony of grace has many songs and they are beautiful. One that Isaiah wrote was in Isaiah 40:31, where the promises that when we serve the Lord or seek His grace or wait on Him like a servant, we will sometimes fly like an eagle, the soaring bird; and sometimes run or work hard but not get tired; and at other times barely walk, but we do not faint. And all of those are the grace of God in our lives. His grace for the combination life is something like the water over Niagara Falls. It does not quit. We all know that it is difficult to really understand grace. Just as people find it difficult to believe Christ can totally forgive them simply by their faith in Him, with admission of sin and need, so we also find it difficult to believe that Christ would stay with us when we stumble. Clearly we need grace every moment. We probably have no idea how many times grace in the person of an angel of God or the Spirit of God have awakened us when our eyelids were drooping while we drive, or stood with us to save us from a disease, or kept us from a temptation, or given us the impulse to obey during that temptation. This grace is sufficient and it is daily. Our part is to abide in Christ and obey Him. And all of this is because God loves us. The reformers realized that God did not give grace where it was deserved, ever. God did not look forward into history and see who would be good for His family. And grace means that God makes us officially and eternally His children the moment we believe and rest in Jesus Christ the Savior and Lord. We can do nothing to add to that in terms of His love for us. Or as he put it in another place, “what then is Apollos? What is Paul? Servants through whom you believed, as the Lord assigned to each. I planted, Apollos watered, but God gave the growth” (I Cor 3:5, 6). Paul went on to say the people who do this are not the point, “but only God who gives the growth.” And we are all to be seeing ourselves as working together with God to have any part we can in spreading His grace. He does say, “let each one take care how he builds upon it (the foundation in Jesus Christ).” That’s all in I Corinthians 3 and a reminder that we should take care how we serve Christ and allow His grace to motivate us. To live in combination with Christ is to have His strength and His wisdom for the day. It is a whole life, not just the decision that starts a new life. We invite Jesus Christ into our lives to walk with us. We stand beside Him in one sense and see our lives as linked with His. He is in us spiritually. We abide in Him spiritually. This is salvation. This of course is the “storm center,” as some have called it of the Reformation—as much as the other Solas anyway. Perhaps one of the strongest issues by Martin Luther and the other reformers was that the entire salvation of us sinners is by free and sovereign grace alone. All of them are important, of course, and in many ways aspects of the same central fact of salvation thought Jesus Christ. But this one is so very practical—because it takes away all pride or human acclamation or feelings that we deserve our new life in Christ. One of the phrases that characterized their differences with the church they were trying to reform: “Monergistic Regeneration.” Our new birth has one source and one pioneer to make it happen—our triune God. So it is His idea and His gift, and we receive none of the credit. And we must be honest about how easy it is to feel some pride about salvation, that maybe God found a good person when He found us. That maybe He selected us because we were willing to believe or He saw what good we would do. The mind of capable of any amount of pride. Thus the safeguard with this emphasis on grace alone. We should bring in the issue of indulgences again. And while the church has official indulgences and did before the Reformation also, people easily feel the need for a type of indulgence by their actions. Personal. Instead of believing that it is all of grace. There is always confusion about grace. Thus the term, “cheap grace.” And so many miss grace as a gift today, and a powerful one—even in the Evangelical church. The assurance of salvation may be one of the nicest and most important gifts of grace that God gives us by His Holy Spirit. Earning Christ’s favor comes out over and over again in the history of churches, especially even on paper before the Reformation. But how many people today feel like they earn God’s favor instead of receive grace—by doing good or by going to church? One of the implications of “infused grace“ is that you keep accumulating it by your good deeds, and finally reach salvation, which you hold on to by accumulating more grace. One of Luther’s emotions that he wrote about: “How do you love a God you dread?” This sermon might discuss the difference between the fear of God and healthy respect, and an awkward fear of God that we dread. Some have taught that we diminish the doctrine of grace by believing in free will. Probably we will not want to get off on this sidetrack, but it is important to recognize that it is there and that some people do not believe in free will. Some of the writings of Reformers equated free will with our having anything to do with salvation. Some of them would state that if we even feel like our believing was something we chose, we diminish grace. The new status we have with the Lord—flowing out of I Corinthians 15:10. Start with the understanding that many people do not have an understanding of grace. They might be able to call it a gift. But often a gift that comes with strings attached or that is earned by prayers or careful living. While we know there are ramifications to receiving grace, or implications, it’s important that we get somewhere close to where the reformers were about grace being totally undeserved. It is not because we were born into a Christian family—though that may give us some advantage of course. It is not because God looked ahead and saw we would live a pretty nice life or obey fairly well. Grace is totally undeserved. This is hard to illustrate from common life, because, as they say, “there aren’t any free lunches.” But God’s grace is spectacular in its freedom. It would be as if you got a call one day and the bank told you that you were receiving and billion dollar gift simply out of the blue. Not because your uncle works there and not because your family has always banked there. Simply out of the blue. While there is much that goes in to our receiving a gift of grace or of Jesus Christ from God, there is not an ounce of effort that goes in to earning it. The outline makes the implication from the verse and tries to deal with the degrees of service that people show. And there are levels of obedience and service to God. Be sure you can have some strong illustrations that show that a true understanding of grace does not make you want to disobey God, but makes us want to serve! The issue of love in a marriage— feeling totally accepted by the other person does not make you want to hurt them or do whatever you wish. It makes you want to show love in return and be kind and loving in response. Perhaps the maturity of a child is related to their getting to the place where they want to say their love to their parents and want to honor their parents. We always pray this is before they finish their teenage years. But real understanding of love and grace motivates service, not freedom. This is an argument against those who say that grace sometimes produces license. Not when grace is really understood. Perhaps you like another word better, but consider having some way to express that the decision to trust Jesus Christ as Savior is not a stop on the road or a destiny. It is the beginning of a life of connection. Okay, indwelling of Christ in us and of us in Him. Certainly “in Christ” is a very common New Testament phrase, especially in Ephesians. It is Christ in us and we are in Him, as pictured in the John 15 illustration of the vine. But saying this as a “combination life” stresses that we are to live in connection with Him the rest of our lives once we commit them or believe or begin the journey of faith. Marriage is a great illustration. Can you live as a single after you are married? People always hesitate to answer. Yes, you should not. But yes, we can. Whether it’s in the lighter issue of not communicating well or making a plan without consulting the other, or the very harsh reality of being unfaithful—yes—we can live like a single. We should not, but we can. And so a Christian who has come to grace or salvation or faith or Christ is meant to live in connection with the person of Jesus Christ, or the Spirit of Christ in us, for the rest of time on earth. This is a very important point of practical application of this sermon. This may be the hardest one of the series of five. No question we can find verses in the Bible that say it is by faith alone—that’s our theme. But no question at all that faith equals believing, and that “the demons believed and trembled,” as James the apostle wrote. So we must define faith as more than acknowledging facts. And we must do that without destroying the very premise of this Sola—that you don’t have to add to true faith. But what is true faith? But then this is why we were asked to be pastors—to clarify truth and challenge and guide our people. Here we go. This is a huge issue. So many people think of faith as something pretty nebulous. One person once said, “I believe, but I just don’t have faith.” Same word. Here is the content of what we are called to believe. And it’s crucial that people understand this if they are to rest assured in the work of Jesus Christ and the person of Jesus Christ. The verses we look at here are from Galatians, but they could just as well have been from Romans especially, or several other verses in the New Testament. But the dramatic story from the Reformation might be that of Martin Luther’s famous “ah-ha” moment as he was hit with the meaning of Romans 1:16, 17. Martin Luther had punished himself extensively to try to deal with his sinful nature. The stories you will read from Reformation notes and books have him sleeping on rocks, punishing himself incessantly for his sins, confessing them over and over again. The moment may be attached to his crawling up the steps doing penance when the realization of the meaning of Romans 1:16 and 17 crashes into his conscience and heart. The verses tell us that in the Gospel “the righteousness of God is revealed from faith to faith; as it is written, but the righteous man shall live by faith” (NASB). Here is one of the great statements in all the Bible that we are declared righteous by God. We do not earn it by our works or our penance or our trying to deal with our own egos. The moment of faith in Jesus Christ—this is the good news of the Gospel—God declares us righteous with the perfect righteousness of His sinless son. God sees us in a new way. And this righteousness is revealed from faith to faith, from one person to another person. This is the beauty of grace. This is the deep meaning of simple faith. In fact all of Romans argues this way, and verses like Romans 4:5 tell us the same concept, that the one who believes “has his faith… reckoned as righteous” (Romans 4:4). We’re talking centuries of people trying to earn their faith—these are the ones who even cared about their standing in front of God. We’re talking millions of people who never went to bed at night with any satisfaction about forgiveness or a right standing in front of a Holy God. We’re talking about the prison (almost) of a lifetime with no assurance of eternal life. Or the utter and desperate giving up of so many people who realized they could not control their emotions or keep up any habit or come to any satisfaction that they were placating a holy God who must judge sin. The fact is that God did judge sin. One sin for all. One Man for all people, one time for all time—at the cross, at the cross, where we see the light if we will. Therefore “being justified by faith, we have peace with God through our Lord Jesus Christ,” says Paul in Romans 5:1. He talks about “this grace in which we stand” (5:5). All through Romans and also Galatians and also in all the New Testament is this constant reminder that it is by faith that we are saved, and saved is not a tenuous position, but a sure connection with a Holy God through His Son Jesus Christ. Through whom He declares us righteous. By whom He accepts us as His beloved. In whom we live and move and have our being and can live with total assurance and confident love. And while all of the Solas in many ways center on the sacrifice of Christ and the revelation of what this means, the special meaning her is related to our responsibility to respond to God’s loving gift. By faith. By believing. By trusting in the person of Jesus Christ and what He did for us at the cross, at the cross. Paul asserts his nationality but immediately goes to the issue of justification. In many ways justification is the goal of every religion, though many people never use that word. It is to get in with God, to be acceptable to the creator of the universe, to balance our sins with more that is good. While Jews of committed faith were trying to keep the law, their faith often rested in their attempts or in their law. So Paul continues his argument about freedom and the law here in Galatians 2 by saying in verse 16, that no one can be “justified by the works of the law.” It’s just impossible. The law has no power. It simply points out our failures. Every one of the Ten shows us that’s not the way we’re made. In his great arguments of Romans 1 and 2 and 3, Paul shows that the whole world is guilty in front of God. Guilty because of creation—for the magnificence of it should cause us to seek to know how it got there! And who the creator is! We are guilty because of our conscience. Everybody goes against his own conscience, and that is wrong and sin. But we are also guilty because of the law. As that comes up in Romans 3 Paul concludes with a verse that says it so no one could misunderstand: “By the works of the law shall no flesh be justified”! (3:20). How can it be then that so many religious people and even those who claim to be Christians say they are trying to keep the law, implying that they are trying to do this to get in with God. On a survey a few years ago, 75% of the people who said they thought they would go to Heaven, added that it would be because they “kept the Ten Commandments.” For sure many of them could not even name many of the Ten. So Paul is clear here that no one is made righteous by keeping the law—and there’s no secret as to why he could say that! We just cannot keep the law. If we could keep it in every part, including our thought life, for Jesus brought that up in the Sermon on the Mount; then we would be in with God and would not need a Savior. But no one qualifies. The law is actually meant to control our lives but also to be a school bus or a school master to bring us to Christ. The proper use of the law would be that it is a condemnation tool—we read it and realize we could never live up to the ways of God. And those who come short of the law—this is part of the holiness of God—face judgment. It is faith in Christ Jesus and what He has done for us that gives us justification. Justification is the act by which a Holy God declares righteous that person who is not righteous on his own, but through faith in Jesus Christ. Our faith in Jesus Christ counts as righteousness—just as Abraham and Sarah’s faith to have a child was counted as righteousness. It is faith in the content of the revelation that God has given us. See Romans 4:1-5. The revelation God has given us is clearly the person and work of Jesus Christ. And while God spoke to the world in many ways and in many times, His last word for us and for right how is Jesus Christ—see Hebrews 1:1-3. And that Jesus “made purification” for our sins, taking the total penalty of judgment for our sins but also promising to all who believe that His perfect obedience to the law and His covering of the righteous life would become effective in our own lives. All of the sacrifices of the Old Testament never justified anybody—they did cover over the sins, and the person believing God was saved by faith. But the sins were left unpunished—see Romans 3:21-26. Left unpunished, that is until Jesus Christ took those sins on His own back, as we say it. He paid the penalty for those sins at the cross of Calvary. This event must be seen as a judicial act by God, the Holy ruler and judge of the universe, who allows the substitutionary atonement of Jesus Christ, the death for us, to become effective. So the moment we believe in Him, that He died for our sins and with all of them “on His back,” at that moment God credits that death for our need and covers us with the righteousness of Christ. This is called saving faith. We can lament and discuss for a long time how this is so easily missed, or how the church went for centuries with this as a doctrine covered over with the traditions of trying to obeying and honoring the leaders of the church as the ones who could say when we were forgiven. So the large issue of Martin Luther and finally others realizing that to be just is to get justice or righteousness as a gift in response to our faith. Again see Romans 1:16, 17. Just as Martin Luther had a life-changing awakening when he realized what that verse means, so should we. Part of the confusion is that we certainly should try to obey the standards of God and live according to the revelation which includes the law and all the Scriptures. But the issue may be the “order of service”! Which comes first? But if we put it in the other order, and try to live in obedience so He will accept us, we will never come to the point of peace in our own minds, let alone come to the point of God’s declaring that now we are holy. And that was the great issue of infused or gradual righteousness verses imputed or immediate righteousness as a standing when we come to God by faith in Jesus Christ. Paul is still speaking about his rebuke of Peter and Judaizers who were saying they should not eat with the Gentiles. So the phrase, “endeavor to be justified in Christ” refers to the idea of keeping the law to be justified. If we try to keep the law to be justified, and yet know that we break it, “is Christ then a servant of sin?” If it was wrong to fellowship with people who were eating with unbelievers, then Christ was wrong—Mark 7:19; Acts 10:13-15. Paul was arguing against Peter but also about any way of being made righteous in front of God by keeping rules. And it is true that whenever we do this we’re probably making up some of the rules anyway. An application of this could be our following traditions of the church or of our families or of our own branch of the church, to be righteous. For many of us that meant attending church every time the doors were open, or some rather superficial ways of staying away from the world or the flesh or the devil—by not attending certain activities or keeping rules that we made up. The fact is we can never keep our own laws let alone God’s. That’s the specific here, but the law is also a deadly option in that we are unable to keep it. Romans 3:19 says, “Now we know that whatever the law says it speaks to those who are under the law, so that every mouth may be stopped, and the whole world may be held accountable to God.” That’s when Paul gives the blanket statement that no one can every be made righteous or justified in God’s sight by the keeping of the law, “since through the law comes knowledge of sin” (Romans 3:20). Just before that in Romans Paul showed how the law condemns us and quoted from a number of passages in the Old Testament—the summary being in verses 10 and 11: “No one is righteous, no, not one; no one understands; no one seeks God… no one does good, not even one.” That’s pretty clear. We’re all sinners and the law is the mirror that we look at and we know we’re in big trouble. We sometimes keep parts of it, but never totally in our thought life and certainly not in actions either. So the law holds us guilty. It is a deadly option indeed to try to please God by keeping rules that He either has given or that we made up. Martine Luther and many of the other Reformers had been through so many ways of trying to please God. And they always flunked, as do we. When shall we learn? Actually you can’t totally separate verses 19 and 20, but because Paul is going to show in verse 20 when this happened—when he was “crucified with Christ.” In God’s eyes he was with Jesus on the cross. But because Jesus was there paying the penalty totally for Paul’s sins of not being able to keep the law, of braking the law, that was when Paul died to the law. So verse 19 is very specific about his dying to the law and verse 20 explains when this happened. When Jesus died with the penalty of the law on His person, the holy laws of God were satisfied. Paul would be forever free, as we are, from the penalties of the law. For he died to the law, in Christ. The law kills us because we can’t keep it. But we also die to law because we started a new life in Jesus Christ. It’s no longer a life of trying to keep the law, but now a life of freedom in Christ and abiding in Christ. choose the life of combination! We cannot be easy or glib on this, but we can appreciate that the cross and the work of Christ there is so complex and so salvific for us. But then, in a real sense, life is much more complex than we first notice, and love, and faith, and eternity! While people struggle with the way—we all do—we also struggle with the what! Who died? What died? While the exact wording of this is not so important, we must understand that it is possible to understand! One strong way to look at it is that the one who died is the old you! You without Christ! Just as the single you died when you got married. A new life starts. Something different has happened. Is there still a you after marriage? Can you live as a single after you are married? Of course. But we’re talking about the right way to look at this and the right way to do it. The old person without Jesus Christ was crucified when faith linked you to the cross. And the new person who lives is a person in combination with Jesus Christ. Paul’s going to say in this verse that it is Christ in you. Both Christ and you. He has just told us that we died to the law. Paul explains in verse 20 that while we “live in the flesh,” in this body, we also live “by faith in the Son of God,” and that faith causes us to obey Him and allow Him to be Lord of our lives. So we are living but Christ is living in us. Thus the word “combination”! Notice that Paul gives a nice kind argument about why we should do this, referring to the Son of God as the “one who loved me and gave himself for me.” A lot of our motivation goes back to what Jesus Christ has done for us of course. See the end of II Corinthians 5 for more on this. It isn’t hard to see the theme of faith all though this issue of how we come to Christ and how we abide in Christ and live our lives. Thus the “faith alone” emphasis of the Reformation deals with not only salvation but also daily Christian living. Paul scolded the Galatians in the next chapter of Galatians by saying, “Are you so foolish? Having begun by the Spirit, are you now being perfected by the flesh?” His argument there is that they continue in Christ by faith, by believing, by trusting Him, not by trying to work their way to a closer friendship. The tricky dance is that the good works can continue and are a result of our faith or should be. Nothing in the Bible plays down the need to obey and do what is right and do good works. But not as a means of getting in with God! Not as our attempt to keep the relationship there. Not as many of the people took it before the Reformation—that our standing in grace depends so much on our own actions. Verse 21 is a very strong witness to the need to emphasize grace through faith. But it also explains that if we could have earned our salvation, or if we could keep it, by our own efforts, then “Christ died needlessly.” And of course we know that is not so. Again, we need to take this so seriously. No one in his right heart would want to say that “Christ died needlessly.” We should also not want to think that we can enter or live the Christian life on our own without our faith being in Him. And of course that is a good statement to make, but not if it’s stating where your faith is for salvation. Some call this one, faith alone, the truth by which the church stands or falls. That does make sense. The issue of life in Christ, living in connection with Him after being justified or being declared righteous, centers on our belief about how we got there. And this one was clearly the storm center of the Reformation, and probably is of many conversations, that may not be said in those words. Perhaps “faith alone” was not the top focus of the reformers. Their main emphasis often was that salvation is by free and sovereign grace alone. They did not start the fellowship of churches called “sovereign grace,” but they certainly emphasized it. So the point here is that it is faith alone in the right person—and not anything else. The big issue is, what gets us righteous? Is it an imputation by God, a declaration of righteousness imputed to us or covering us because of Jesus Christ; or is it a gradual infusion of grace and righteousness that comes by our obedient practices of worship and sacraments and service? It is not faith in our faith or our practices. It is faith in a person. Belief in Jesus Christ and who He is and what He has done and what He does now. It is faith that turns us to follow this person. But it’s easy for us to rest in our own practices or habits of faith. We have gone to church all our lives. We have said the right things about Jesus Christ. But when our faith is in our own selves or our practices or even our faith, we will lose confidence and drift away. The central theme in the Bible is always Jesus, the Christ. He is our salvation. He is the object of our faith. Galatians 2:20 has been the “life verse” of many people. It’s concepts are central to a good view of the Christian life. But many times only one part of it is emphasized. The “combination” is a good way to look at this. It seems to be the way Paul said it—that he still lives, but Christ lives in him. Could we see marriage as an illustration of this? You die to self or to the single life, and vow to live to the other person or to the combination life called marriage. So it is with Christ. We can easily get to major on ways of saying all this. Not just “the crucified life,” but many “secrets” of a Christian life come out of this verse or others. But even the apostle Paul said the Christian life or described it many different ways. Sometimes he emphasized his own efforts—he “worked harder” than anyone—see I Corinthians 15:10, 11. He buffeted his body and his own spirit to do what is right and make progress and witness to others (I Cor 9:24 and forward). He ran the race and considered himself dead to sin—II Timothy 4:7 and Galatians 2:19-21. No one has a secret way to say this or the only correct way. But there is the way to live in Christ, to abide in Him, and to have Him by His Spirit to abide in us. It’s not that everyone understands that since the Reformation. But we have to think that many thousands and millions of people did little to think about their relationship to Christ. They just hoped the church would be the way that they handle their religious needs. The Reformation and anyone who studies the Bible and comes to conclusions of Romans and Galatians and other books, at least enables a person to more freely live with confidence and the hope that is in Jesus Christ and in the life that is pictured as abiding in Christ and Christ in us. “I hated him”! That’s a quote from Martin Luther, one of many that show how hard he tried to please God and how much he realized that he could never keep the laws of God or do enough. Augustine wrote related to this same idea, that God supplies what He demands. And we must realize that along with these great leaders and writers. Some have said it this way, that Jesus got what He did not deserve so that we do not get what we deserve. Jesus took on Himself all of our sin—and He certainly did not deserve to be “made sin for us,” for He “knew no sin” (II Corinthians 5:15). And what we get is the imputed righteousness of Christ, or the fact that God covers us with the perfection that only His Son actually had. Perfect righteousness. Thus the sadness and even the anger and the final conclusion that belonged to Luther—that we must turn to God’s grace, Reform our thinking, and start over by faith alone. We all admit how hard it is not to add our efforts to our faith. To say things like, “I believe and I’m doing the best I can…” Faith means believe that Christ is enough. The confusion about what James says about looking at a man “justified by works.” If you have time, you might want to bring in what James writes to Christians on the other side of the river of judgment, calling them to show their faith by their works. True faith always works. Romans, on the other hand, was written to help people understand that it is faith in Jesus Christ that gets us across that river of judgment. Full disclosure: Martin Luther did not like the book of James because of what it said about works. Romans 3, our text about Christ but also very strong about our faith in Christ, shows that both the righteousness of God and justice of God are featured and become effective when we put our faith in Jesus Christ. Christ becomes our righteousness and the justice of God is fulfilled because of the death of Christ as a punishment for sins. Our sins. One of the strong points of Luther’s realization is that we are saved by sheer grace and mercy thanks to the gift of the perfections of Christ. This is where the contrast between the imputation of righteousness and the infusion, gradually, of righteousness. The Reformed teaching of course hangs on the imputation of righteousness as the goodness of Jesus is credited to our account and His death or punishment for sins is as well. Luther felt that the doctrine of justification by faith alone was at the center of the corruption in the Roman church—that is, the lack of faith in that kind of justification. Therefore the strong movement to earn salvation or pay for indulgences or stay steady in commitment so that grace continues to be infused into your life and to cover your name. This is a most crucial issue—a theological and personal explanation of what really happened on the cross. When he had finished his two minutes, he had never mentioned the cross. Another who answered that same question emphasized that the person in the hospital bed should “commit his life to Jesus Christ.” And he was asked when he was finished how the person was do that when the person only had two minutes of life left to live! The good of the triangle is that it shows what we are called to believe. Clearly, “the demons believe and tremble”—James says it that way. So it’s not just believing the facts that Jesus was here or believing that He died and rose again. In a true and false test, demons would get 100 until you came to the question about living a life in connection with Jesus Christ and His Spirit. So the passion of the first part of this sermon is related to understand what our faith or who our faith is to be in! We also have the stress that many people go through because they have been told or even decided that they do not have enough faith to be healed or even to be saved. Most of us would say that you either have faith or you do not. And we might even refer to the mustard seed story that Jesus told. But for sure we must understand the content of what happened on the cross, and these verses in Romans seem to do that handily for us, and have the added virtue of being inspired by the Spirit of God. And written by the great theologian, Paul, who seemed to have this all together. Some churches have asked people in the membership class to learn this and to be able to explain the errors. One good point is that the information relates to eternal life and to their personal connections to Jesus Christ. But another is that all of us need some content to share with other people. What it means to have faith. Perhaps you have many illustrations of what faith is—sitting on a chair—more than just saying the chair can hold you, you sit down. Getting married—more than just saying you are in love, you commit your life to a person and receive his or her commitment to you. 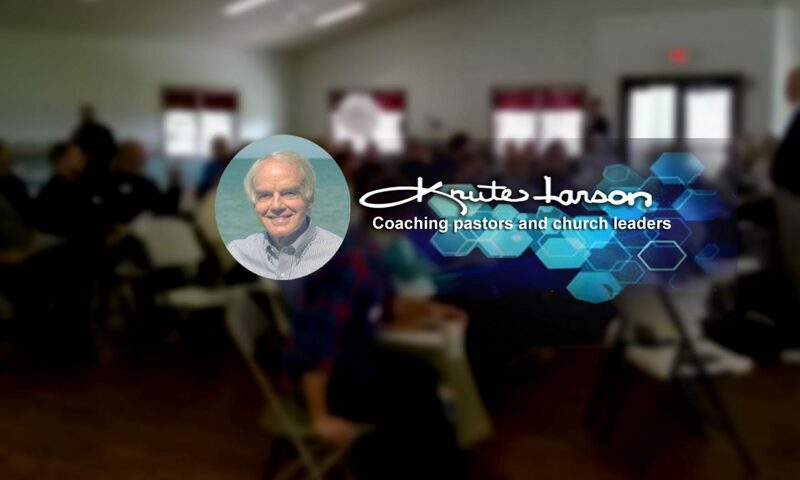 There is no question that many people have faith in their faith or their church attendance. By the way, the old question from “evangelism explosion and Coral Ridge Presbyterian Church” is a good question: “If you died today and went to Heaven and God said, ‘Why should I let you in?’ what would you say?” Now we all know it doesn’t quite work that way, but the question works well to help you see and even say what you are trusting in. Seventy-five percent of Americans referred to the Ten Commandments which no one can keep. Obviously such people are just kidding themselves, or more likely, just avoiding the question when asked on the street corner when asked on the street corner by a representative of a poll-taker. Point is, this definition of where our faith lies and what Jesus did on the cross—these are very important. Whatever way you finally say what it means to be saved or to believe in Jesus, be sure that it has content. And be sure that it centers on a person. And it would seem that in this series on the Reformation we aught to also accept an ancillary teaching that every Christian is a priest and every Christian should be a witness. And if we are to be witnesses, we must have content to our testimony. So many people say they believe in Jesus Christ, even that they have faith in Him (some do not know that the words “faith” and “believe” are really forms of the same Greek word). But many live with no assurance of eternal life or a confident standing in front of a Holy God. And we probably should be very nervous about this and actually afraid when we realize how holy God is and how sinful we are. That is, except for the truth that God sent His only Son and makes provision for our unholiness in His merciful and holy way. Christ becomes our righteousness and our confidence and our standing in front of God. Christ is our substitute for the judgment of sin. John, who knew Jesus so well, writes toward the end of his I John letter, “These things I have written to you who believe in the name of the Son of God, in order that you may know that you have eternal life.” See John 20:31 also, where he tells why all those miracles and truths about Jesus were written in the Gospel. So we might believe and so that when we believe we might know for sure and live as if we have eternal life. So it is by believing, by our faith in Jesus Christ that we live with total assurance that all is right and all is well and we are His. At the close of this sermon, as with others, it would be a good time to urge people to be sure that they believe but also then be sure that they rest assured with confidence in the person of Jesus Christ. We may know without a shadow of a doubt. It is the simplest of all illustrations of faith, and it can be a good one—that if we believe a chair will hold us we will sit down on it. Looking at the chair or saying we believe it is strong enough does not do it. We must sit down. Talking about who Jesus is or even what He did on the cross or saying that we know it is true is not the kind of affirming or responsive faith that the Bible calls for. Believing means believing, and “sitting down” on that truth. Resting in Jesus Christ and what He has done for us. So true belief means true resting. Reliance. It is not just a feeling it is an embracing of the facts and putting our trust in the person and work of Jesus Christ. This may be the hardest one in terms of being specific. All of us who study creation or theology, and the Scriptures, would readily say that we were made for the glory of God, and then to live for that purpose. We have to give credit to the reformers—they were people like we are—for emphasizing this. We need it in the church. Always did. Always will. And one primary goal here will be to explain when God is glorified by our lives, and then to motivate people to live that way. It certainly has to be more than just a passing thought, but rather a dominate purpose for life. Some things glorify God by their beauty. Check the mountains or the skies or the giraffes, and then the fish. But then realize that’s a passive glorifying. They do not intend to live that way or make decisions that way. But human beings were made in God’s image, with decision abilities, choices, spiritual attitudes. We glorify God by intentional commitment and obedience. By purposeful living that is meant to point to Him or enlarge His reputation or honor His name. And there are clear definitions of how that works. So if we can get past the “nebulous” barrier, this could be in some ways the most important thing we say in this series. What if three teenagers and five adults turn to this as a new purpose for life? Or 50? That would make this a very important subject. In many ways the Reformation is all about justification by grace through faith, our being declared righteous by a holy God because of the perfection and provision of Jesus Christ. And one of the side issues—can we say that without making it small—is the priesthood of all believers and the purpose of all activities and the glory that should be given to God by all of us all of the time. Of course the teaching that we are to grow in works of righteousness so that we gradually assume a righteous standing in front of God calls for someone to help us do this and interpret the Bible for us and to be our inter-mediator with God. The priesthood had been and still is made up of many different kinds of people, and many of them sincerely trying to represent people to God and the work of redemption and Christian living. But part of the theses and teachings that Martin Luther made famous or at least pioneered was the priesthood of all believers. And we easily lose that today. But the priesthood of all believers means we all go directly to God through the one mediator, the man Christ Jesus (I Timothy 2:5). And Luther had some strong teaching on this, calling for people to bring glory to God with everything they did. For instance, he said that a cobbler did not need to put a cross on the bottom of the shoes when he made them to give glory to God—God likes people to have shoes and the cobbler can do his work as unto the Lord. The homemaker does not have to sing a hymn as he or she scrubs a floor at home to be glorifying God with that activity. God likes clean floors. Surely we would all agree that Adam and Eve were glorifying God when they were doing the work assigned to them—the Lord’s work, which was keeping the garden or naming the animals or subduing the earth. Martin Luther wrote that God milks cows but He does it through the people who work at the dairy or on the farm. I Corinthians 10:31, in a context of the liberty issues of life, tells us, “whether, then, you eat or drink, or whatever you do, do all to the glory of God.” And while that is in the context of liberty and how we choose to do things, it can be applied to all of life. This Reformation “Sola” is about giving God the glory and not other people and saints or the church or the priest. But it is also freeing us to know that we can live all of our lives out of love for Him and to glorify Him. These were not the verses that prompted the emphasis on glory to God alone as opposed to giving glory to the church or to saints or to Mary or to priests or to ourselves! But they are verses that are very practical as well as doxological. And the ability of God is stated as Jude begins his signoff benediction. And what amazing abilities he emphasizes: that God is able to keep us from falling (away from the faith or into danger or into Hell) and to “present you before His glorious presence without fault and with great joy”! What a promise. What ability! These verses are at the tail end of a little letter of Jude, which depicts so much falling away from God. And so do the newspapers. And so do our own hearts if we’re not careful. But God is able to preserve us and keep us going. Therefore He is worthy of singular glory. Hebrews 2:18 gives the famous promise that He is able to help us when we’re tempted in any way. One of the most heart-warming promises God ever gave. So we should honor Him exclusively. And He is able not only to keep us from slipping into apostasy, but to help us on the daily walk. It’s not just the momentous fall in to apostasy or turning away from the faith as we sometimes see. But even to help us on a daily basis. To help us when we are tempted. James 1:21 says that the Scriptures are “able to save your souls,” and often our salvation—small s—is involved here. God keeps us by reminding us of something from His Word. He guards us. He keeps us from falling. “He will not suffer thy foot to be moved; He that keepeth Israel shall not slumber” (Psalms 121:3). God does not go to sleep but holds us by our right hand (Psalm 73). So God or grace does what we cannot do. He does what no saint can do or no church leader. Just as we cannot raise a garden without God’s grace, we cannot guide our lives without His strength. He gives the increase. He gives the strength. And here our responsibility is to stay close to Him. To trust Him. To obey Him. There are so many verses that speak of this, but easily we do not believe them. Because we are covered by the righteousness of Christ—do not forget “grace alone” and “faith alone” and especially “Christ alone”! Because of that righteousness and who Christ is for us, we can celebrate and rest in Him and accept the challenges of life with confidence. Notice that He will present us in the presence of the Holy God who cannot accept sin, and He will do it “without fault”—a phrase used of Jesus as our lamb for the perfect sacrifice—I Peter 1:19. The promise is that we will be without blemish. Free from fault. Clean! And all because of Christ. We are kept for Jesus Christ. We have nothing to say to get us into Heaven except, “I’m with Him.” And being with Him means we are with His righteousness which is given by grace through faith. This is about being in the presence of God forever and ever. Saints and church leaders and even parents can only point to Christ but are not the ones to be glorified for this magnificent promise. This reason feels like the epitome of our hopes—a contrast to all the rest of the book of Jude and even to the rest of history and of our personal hearts. We are so sinful. But here is the promise that God will help us stand “without fault” and filled with joy at the end time! Back to Martin Luther’s famous warning and truth: “We only have two days—today and ‘that day’”! And this is that day when we will stand in front of Christ and do so because of Christ! So today we should live for His glory. There are so many applications of this short benediction—and the primary one in the context of this series is to show that we should not give glory to church leaders or church traditions or ourselves. But teach it first as a call for all of us everyday, Reformation or no Reformation! He should receive glory or doxa. This is because of His radiance and who He is and His actions. This is the brightness of Christ. He has the same glory as the Father—John 17:5. Hebrews says in Hebrews 1:3 that He is the brightness of the glory of the Father. As the sun has rays that shine and we feel some of it, the rays of the Son shine in our lives. But He is in totality the perfect glory of God. And so we should glorify Him. We do that as we sing and live and obey and speak about Him to others and pray our love to Him. His majesty is also what we should give to Him. This is related to His kingly greatness. It is the way we honor Him. Isaiah the prophet asks us, “To whom will you liken me, or shall I be equal” (Isaiah 40:25). God again speaks: “I am the Lord, and there is no one else” (Isaiah 45:18). Only our Lord Jesus Christ deserves the term, literally, His majesty. “Power” or “dominion.” He is the Lord. This is the might of His power—see Ephesians 1:19. He is the master creator and owner of the universe. He is the sovereign Lord. All that He says comes to pass. Because He says it, it is so. This is one who with power and authority said, “Let there be light.” And there was light because He said so. This is the one who said to the Red Sea, divide and make dry ground for the children of Israel. And because he said it, it is so. He has all power and authority. This is the one who said a couple of words and the storm on the Sea of Galilee was stopped immediately. Not because a committee of angels rushed down to stop the wind or smooth the sea, but because He says it, it is so. This is the same authority word he used in Matthew 28:18—all “authority” was given to Him. It is the authority seen in Christ in the last Revelation—12:10. We should think of the celebration or acclaim given to sports heroes of church leaders or saints, and take some of it back. Unto Christ should be the “glory in the church” (Ephesians 3:21). This is why we worship in church, with gusto, with the promise of this verse in mind. Surely this is why Paul concludes his argument about liberty issues in the famous I Corinthians 10:31: “Whether you eat or drink, or whatever you do, do all to the glory of God.” So this is about small acts of life and worship as well as the general giving of our lives to the Lord and also acclaim to Him and worship. And giving glory to no one else. “Glory to God alone” comes out of the Reformation but should also be seen in our lives. Here again in Jude is the centrality in any benediction or in the story of salvation—it belongs to Jesus Christ our Lord and Savior. We can call God the Father our Savior and we can call Jesus Christ our Savior. But the big issue is that we are not our own savior. Jude closes his letter by giving the glory to Jesus Christ and centering on Him. This is of course strong theology for every day of life. Philippians 2 concludes the wonderful praise to Jesus Christ by saying that someday every tongue and every person will worship Him—Philippians 2:12, 13. His is the name above all names—see Revelation 19:16. That would mean all the time. That would mean at creation when the morning stars sang for glory. That would mean when God delivered Israel in the crossing of the Red Sea or the many miracles day after day. That would mean that it’s part of the great symphony that was sung when Jesus was born at Bethlehem. That would mean this is part of the ages-old song that will be sung every time we give thanks that a loved one has gone to be with Christ. And the great crescendo of this glory to Christ will be on that Last Day, “That Day,” when Jesus returns and all the world bows the knee. But this is the Jude who also saw his resurrected brother, who had died for the sins of Jude and all of us. And so he speaks of eternity, the glorious thought, which is so far above the little bit of glory we see in this world. And the eternity referred to is the glorious state that will continue the work that the flowers and mountains have begun—to point to Christ. It is the fulfillment of life that is given in new babies, but now it is life that will never cease. It is the eternity of constant rainbows, in one sense, of continuous choirs, of joyful laughter. With no more tears. For ever and ever and ever. We can wish we had two plus two equals four answers to all the questions of life, but it is too amazing and too large. And the universe is vast. And the spiritual world is often elusive. So many times we might say, “I do not know, I do not know.” But we trust. And we worship. We are tiny and small—that’s what we are, but we can give God glory and praise. And no one else, on that level. The word “Amen,” ends the book of Jude and ends this series on the Reformation, and hopefully, begins a reminder to live for His glory and keep Him on a level distant from anyone else. Especially ourselves. For ever and ever and ever. Amen. Nothing comes close. And “Amen” of course means that we agree. Help your people say, “Amen” in the context of Jude and all the warnings that were then and now. Jude is the little book that has so much evil in it as it tells how people fell away from Christ or chose their own ways. But it is also Amen to the reminder that evil permeates the headlines and even much of our day as we see a fallen world falling even further. But it is Amen to a person—Jesus Christ. Who did by grace and love what no ruler could do by force and hate. Today children and adults all over the world find their greatest joy in trusting and obeying Him. And the church lifts up the cross and the glory of Jesus Christ and gives it to no other. And every day we should be Reformed again, to honor and obey and give pleasure to Jesus Christ. This is obviously something that people need to think about again and again—that all of life is to be lived for the glory of God. That there is a purpose for what we do. We are not alone in life, and we are not to live for ourselves. So the general application has to do with our dominant purpose in life, and moving away from selfishness and pride. Which is hard for sure. But of course this one too is a reforming of the practices of the church in those days, and one that should help us in our days. The phrase specifically stands in opposition to the worship or veneration at least that was present in the Roman church in those days, especially to Mary and some of the other saints. This is therefor the teaching that all glory is to be given to God alone, since all the other Solas are very true. No one else comes close to being the one in whom we put faith, or the giver of grace, or the center of the teachings of Scripture. It is Jesus Christ. The reformers believed that all those saints who were canonized by the church or the popes were not worthy of glory or worship. Unless we call this only a Roman tradition, let us be sure. It is easy today to elevate a hero or heroine of the faith to a position much higher than they deserve. So this Sola was in opposition to any of that then, but also helps us to think clearly today. It is one thing to respect someone for their ministry, and quite another to elevate them to be more than human. But once you deal with that doctrinal issue or that prohibition point, be sure to dwell on the issue of our high purpose in life—to bring glory to God and to live for His pleasure. In many ways this may be the most nebulous of the five—perhaps not, but it can be just a cliché or a saying instead of a very practical and strong guideline for life. It’s interesting that some Anglican scholars have suggested that there should be two additional Solas on the list instead of the five, making seven—the church alone, and love alone. Indeed both of them relate to glory to God, as the church was formed for His glory and for His work in the world. And love is the goal of life. But we are not seeing them as high in emphasis in the writings of the reformers. Or as important in our lives if we really care for the others. There are many verses that clearly command that God should be glorified, and others that imply it because He is the maker of heavens and earth and also our salvation. When Paul revealed the future in Ephesians chapter 1 he referred to the “summing up of all things in Christ, things in the Heavens and things upon the Earth” (Ephesians 1:10). In other words, in Christ everything will come to an end—some people like to call it the beginning because then the eternal state of heaven and earth and hell come in. Verse 11 in the context speaks of our predestination “according to His purpose who works all things after the council of His will.” Paul is on a roll about statements that are so high we can only worship and give Him glory. He has already said that in Christ “we have redemption through His blood, the forgiveness of our trespasses, according the riches of His grace, which He lavished upon us” (Ephesians 1:6, 7). And all of life now should be to the praise of His glory, and to no one else. So this is the purpose of life and salvation and eternity: the glory of Jesus Christ. It’s important that we understand the context to be that he is God, “the LORD who created the Heavens and stretched them out, who spread out the earth and what comes from it” (42:5). Behind His call for exclusive glory is the fact that God is our creator and this was all made for His please and glory. Including us. So it is not an arbitrary or selfish issue that is at stake here. We were made to glorify God. Isaiah 43:7 backs this up in such a strong way: God refers to “everyone who is called by my name, whom I created for my glory, whom I formed and made.” We were made in the image of God, which means a number of things including that we are spiritual and can know Him and be connected and even “image” Him by the way that we live in connection with Jesus Christ, who is the perfect image of God. Romans begins with the glorious call to the Gospel which is foundational to the whole Reformation but also to our daily lives. It is that the Gospel “is the power of God for salvation to everyone who believes…. For in it the righteousness of God is revealed from faith to faith.” Righteousness comes by faith and it is needed because we are so unrighteous. That’s what Romans 1:18 starts to explain when it says, “The wrath of God is revealed from Heaven against all ungodliness and unrighteousness of men.” Those people covered over the truth. They actually knew about God because God had revealed himself to them—in fact He has to all of us through creation at least. The Bible is clear on this that “since the creation of the world, and the things that have been made, God, is revealed.” So people are “without excuse” (Romans 1:20). Then the great turning point—perhaps not an actual event in history as much as the constant story of history, of nations and individuals. “For although they knew God, they did not honor Him as God, or give thanks to Him” (Romans 1:21). That verse and the next few show the decline of human nature—again, traceable in history but also in personal lives easily. They stopped honoring God as God and stopped being thankful. They became selfish or empty and dark in their hearts. Some even turned to idolatry, and many to lust, and all kinds of sexual sins and selfish passions. The rest of that chapter shows that because of this God gave them up “to a debased mind to do what aught not to be done” (Romans 1:28). And that’s the beginning of Paul’s explanation that we are without excuse and we have turned against Him, each to his own way. Chapters 1 and 2 and parts of chapter 3 in Romans show that creation shows the power of God but we decided not to pay any attention; our conscience holds us guilty and is meant to turn us to a way of salvation, but many of us did not pay any attention to that (like taping over the light on the dashboard instead of trying to get the need fixed); and then in chapter 3 he talks about the law itself which condemns us all and yet people still try to keep it or at least say they do as their way of getting in with God or being righteous. And all that ends with Romans 3:20 where Paul states that no one will ever be justified in God’s sight by keeping the law. So who we honor with our lives becomes our focus, and honor is to be only to God. And so our focus should be on God. All of this is a reminder of how the church through the centuries easily turned away from honoring their creator and His plan of salvation, to forming their own traditions and even giving glory to themselves or even their heroes. It is easy to glorify saints or the pastor or the priest. There must be a fine line between the elevation we sometimes give to writers or speakers who are charismatic in personality and original in writings. Out of the Reformation comes the reaction to any elevation of saints past and present, to the point of giving them the glory due to God. One of the rulings that regarded Martin Luther as a heretic was that “his teaching makes for rebellion, division, war, murder, robbery, arson, and the collapse of Christendom.” They felt that his teaching about the sacraments and grace for individuals and security by trusting the righteousness of Christ took the proper respect away from the church. It must be a fine line for proper respect for someone who is the leader in church or the pastor or priest, to that of giving them glory above that of a human being. This sermon should emphasize—and this away from the controversy a bit—that we are called to glorify God by our lives and also by our church services. It is there that we look up as a group to honor Him. Only human beings made in the image of God and with the need to worship and ability—only boys and girls and men and women can express glory to God by their personal choice. All of creation shows His glory and displays His magnificent handiwork of course. But we choose to worship. Let’s talk about compartmentalization. It’s an okay word actually, but it’s a sin when it’s something we do with our spiritual lives. When President Bill Clinton got into trouble, he blamed it partly on “compartmentalization.” That is, putting his spiritual life in one slice of the pie and then separating it from the other decision of life. And it’s very easy to do when it comes to our purpose for living. At work it may be to get a promotion or be successful. At home it may be to be comfortable. At church it may be to worship or love people—as good as those things are. But what this Sola says for all of us is that all of life is meant to be lived for the glory of God. And that means “whether we eat or drink, or whatever we do,” as it says in I Corinthians 10:31. I asked him if he knew any carpenters in the Bible. And he did get the point. Jesus did not glorify God as a carpenter because He sang hymns while he nailed or ran the saw. A homemaker does not have to be thinking about a verse as he or she scrubs floors. All of life is to be lived for God’s glory, just as the mountains show His glory and the rivers His strength. Our lives should show not only the evidence of His Spirit but also a purpose to look up and glorify Him. And the emphasis in this lesson is that our salvation or the church or what we do should all be done for the glory of God. When people are done hearing our testimony—whether formal or informal, they should not be thinking what a nice person we were or how desperate we were or how cool we have been in our commitment. They should be glorifying God. The motive is a giant one. To do all for God’s glory. It is not easy. It is a conscious decision. Perhaps a good illustration would go back to the rededications that many of us did years ago at camp—usually on Friday evening. There probably was some good to that by the way. But clearly this is not about a decision we made every Sunday or every year. This is about a purpose to life. It is such a good thing and meant to help us all the time. It is a way of life. In many ways it is what we signed up for when we began to follow Christ. Use the illustration about the original Disciples—everything they did was about following Christ. It doesn’t mean they sang a hymn while they had lunch. It doesn’t mean that they never stumbled as they walked with Him. Or as they taught. But it means that the overriding motive was abiding in their hearts—to follow Him. To be His students for He was their rabbi or teacher or master and savior. And when we arrive in Heaven we will not go to a question-answer session, but rather melt in worship and give glory to God. And that’s why we were created. Now it is for us to guard this as we grow. We can, and it is possible for sure. Both are runners, and training for the Olympics of 1924 in Paris, France. Eric Liddell runs for the glory of God. A direct quote is, “I run fast, I feel the pleasure of God when I run.” He wanted to run to please God and to glorify Him. We jump to the end of the story for our purposes related to this sermon: he wins the gold in his dash at the Olympics, and his friends hoist him to their shoulders and he points to the Heavens and “Tebows” before that was famous. He laughs. He gives the glory to God and enjoys it. Harold Abrams, who ran a different race in the same Olympics and was the second person understudy in the book and movie, apparently ran for Harold Abrams. When he won the gold in his event, he did not know what to do with it. The movie depicts him sitting at a Paris café on the sidewalk, with his coach, Sam Mussobini. Harold is getting depressed and trying to get drunk to drown his sorrows. He doesn’t know what to do with the gold. But that is not enough. The camera comes in close and Harold takes another sip of beer. It is not enough to live for yourself. It is very shallow to have motives that bring glory to your own ego. The natural way to live is not enough. We are made for the glory of God. The leader of the country had a very vivid dream about a tree that grew very, very large and high and strong. In fact, the whole world could see it. It was huge. But then someone came down from Heaven and said the tree was to be chopped down and stripped of its fruit and bark and become worthless. And the life that the tree symbolized would become like an animal. It was Nebuchadnezzar in Daniel 4, and this king of the giant world power had his dream interpreted by Daniel, and it did come true. The king was the tree, large in his glory. High in his splendor, and proud as could be. Even after he heard the interpretation about the dream and that it was his life and that he would be cut down, he did not take the caution. “Twelve months later he was walking on the roof of the royal palace of Babylon.” And he reflected and said, and either to himself or to the people around him, “Is this not Babylon the great, which I myself have built as a royal residence by the might of my power and the glory of my majesty” (Daniel 4:29, 30). The voice from Heaven immediately said that the king’s sovereignty had been removed from him, and his life would be chopped down, and he would be given “grass to eat like cattle, and seven periods of time will pass over you, until you recognize that the Most High is ruler over the realm of mankind” (Daniel 4:28-32). And Nebuchadnezzar became like an animal in the field, and ate grass like the cattle. We should not give glory to ourselves or others. All glory to God! The good in Daniel 4 is that Nebuchadnezzar did learn the lesson and raised his heart toward Heaven and blessed the Most High and praised and honored him who lives forever (Daniel 4:34). In that repentance, he proclaimed that all dominion belongs to God. He confessed that all the inhabitants of the Earth amount to nothing in contrast to God. And that only God should receive glory (Daniel 4:34, 35). We are called to learn the lesson that people often skip—that God is the giver of every good and perfect gift and should be thanked and glorified when good things happen to us. That people can be admired, applauded, and appreciated, but only God is to be worshiped and to receive glory. It is a great lesson not just for the Reformers, but for all time. Our athletes are idolized, and it’s easy to come close if you like sports and to talk about it or to watch games. The glory an athlete receives when he or she hits a home run or scores a triple double in basketball—there’s no sense fighting over if this is a false kind of glory or a mistake or a sin. It is voluntary glory, of course. And you could give many illustrations in a sermon about how we give glory to each other or to our heroes or to our leaders. But the big issue would be ultimate glory and worship. And it’s easy for people in the church to give glory to their leaders or theirs heroes of faith or their writers that they enjoy. Instead all of what we do at the church should bring glory to God and to His beloved Son. So the very practical need for a church service or a Christian to reflect Christ and not the “performers” up front becomes a guideline. Many who analyze a church service talk about a worship leader or a person preaching who is distracting because of personal habits or things that call attention to themselves. Or the use of the pronoun “I” in every sentence. So this Sola from the changes in the church is also a reminder for all of us to be careful that our lives are lived for the glory of Christ. When Paul was helping the people to decide how to draw the line on issues of liberty, he made the famous statement, “Whether therefore you eat or drink, or whatever you do, do all to the glory of God” (I Corinthians 10:31). Meaning, let your motives be to please Christ and give Him credit and give Him the honor rather than have your own way or to hurt someone or to do something just because you want to. So it’s a good challenge for all of us, to ask ourselves if our lives show evidence of His presence. You may wish to take some time about how sainthood happens through the church, and the glory that has been given to leaders in the church, not only in the Roman church but in most Protestant church. But the better option would be that we credit people with knowing Christ and get back to glory to Christ alone.